Recently, I attended a workshop called Experiencing and Understanding Shamanic Journeywork. The presentation was conducted by a female Shaman, who is fully trained and initiated into the, “tradition of the Q’ero medicine people of Peru." The experience was mind-blowing. The most intriguing part of the workshop was the latter segment. It was the part where the audience actually experienced a shamanic journey. Before descending into the underworld (earth), it was essential to attain a heightened state of awareness. This was accomplished by a series of breathing exercises. The exercises enabled us to relax the body and mind, and let go of all mundane thoughts. By the time the breathing exercises were concluded, I was feeling very relaxed, and detached from all thoughts and surroundings. The room, speaker and people around me no longer existed. As I continued to journey into the underworld, I felt a sensation as if my body was submerging into the earth. I was becoming one with the earth. As the process continued, I found myself going deeper and deeper inside. When I reached the underworld, I looked around and noticed that I was in a cave. Although most of the cave was dark, some light was coming through an opening. As I approached the opening of the cave and stepped out, I was bathed with warm and glowing sunlight. In front of me was a stream with the most incredible translucent water. I decided to step into the water, sit down and close my eyes. The warmth of the sun and water embraced my body. Slowly, I began to drift gently downstream. I was not fearful of the unknown or where I was being pulled. I was living in the moment and wanted to continue enjoying it. Suddenly, my body stopped moving. I opened my eyes and saw the most dazzling white sand. Walking on the sand seemed as if I was walking on air- a very strange sensation. I continued walking until I came to a pathway. Both sides of the pathway were covered with beautiful and colorful flowers. I looked at my clothes and noticed that they were completely dry. I continued walking until an older man appeared. 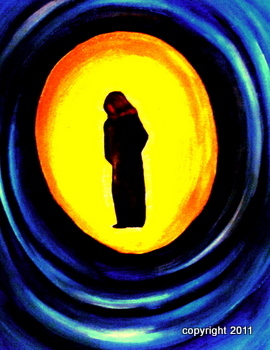 The man was dressed in a long white ancient looking robe. His hair was long, and completely white. He seemed as if he had been waiting for me. When I asked for permission to enter his domain, he politely acceded. After thanking him, I continued walking forward. I kept on walking until I came across a massive ball of light. From within, a hand emerged. I grabbed it and walked inside. The inside consisted of an immense luminous white yellow light. Although I could not see the figure that had welcomed me, I knew it was nearby. I sat down and felt the energy of the light permeating my entire being. Besides receiving energy, something else was happening. The spiritual being, who was now by my side, was merging with me. We were becoming one. When the process was over, I calmly got up and walked outside. Waiting for me, was a large beautiful wolf. He was there as a protector and guide. As we commenced the journey back home, I felt immensely calm and cared for. I did not see the older man on my way out. We journeyed upstream to the location of the cave. All the time, my lovely animal guide remained by my side. By now, I heard a far away voice saying, “it's time to come back." I opened my eyes and realized I was back in the room where it all started. Although I did not place spirit and animal guides into my third eye or heart charka-as directed by the Shaman in the beginning of the journey- I felt they were deep inside me. Their strength and energy were now a part of me. I attended the workshop expecting very little and walked away feeling invincible. Go to Spiritual Shaman to read about my visit to a Shaman.